Vascular complications due to intravenous (IV) drug abuse are amongst challenging situations faced by physicians worldwide. These complications include pseudoaneurysm formation, deep venous thrombosis (DVT), arteriovenous fistula, infected thrombi and arterial embolisation and gangrene. The most common vascular complication of IV drug abuse is infected pseudoaneurysm and can be devastating in the event of rupture. Reports of extremity gangrene from indiscriminate use of injectable opioids such as pentazocine is scarce in the literature. We present a case of a young female who had hip disarticulation for right lower limb gangrene following chronic abuse of self-administered pentazocine injection into her thighs. A lady in her 30s woman presented to our facility with 5-day history of gangrene of the right leg. She was a self-employed single mother who had been suffering from depression due to marriage and child care problems for 10 years. She, however, began the abuse of substances such as Indian hemp, tobacco and pentazocine about 10 years ago. She injects pentazocine intramuscularly into her thighs, initially about 30–60 mg/day but gradually increased the number of daily injections to 150–300 mg to achieve the desired euphoria and relief of symptoms. Despite detoxification sessions at rehabilitation centres, she kept abusing these substances predominantly injection pentazocine. Over the years, she had developed multiple scars on her thighs and ulceration at different stages of healing. She accidentally stumbled into the femoral vessel in her right groin area, and due to the rapid onset of euphoria observed, she continued with daily injection of the drug into the same vessel. A year before presentation, she had DVT of the right lower limb which was managed with subcutaneous enoxaparin. Six days before presentation to our hospital, she went into haemorrhagic shock following a torrential bleeding from the right femoral artery with about 2 l of blood loss. She had initial resuscitation at a referral hospital with transfusion of 8 pints of blood, ligation of the right common femoral artery (CFA) and an iliofemoral bypass surgery with polytetrafluoroethylene (PTFE) graft. The patient presented to our facility with gangrene of the right leg of 5-day duration. This was noticed on the 1st post-operative day at the referral centre, initially involving the right foot alone but gradually progressed to involve the entire right leg. She was neither a known hypertensive nor diabetic, and there was no history of surgery to the right lower limb. However, there was a positive family history of peripheral vascular disease with a history of lower limb amputation in her father. At presentation, she was haemodynamically stable. The musculoskeletal examination revealed a swollen right lower limb with multiple scars on the thigh. She had a right inguinal wound which measured 4 cm × 2 cm × 1 cm, with purulent discharge and contained in its floor are sloughs and ligated femoral vessels. A longitudinal sutured surgical wound on the anteromedial aspect of the right thigh with serous discharge was also noted. There was dark discoloration of the right foot and leg up to the knees with multiple blisters [Figure 1]a and [Figure 1]b. There was anaesthesia of the right leg and foot, hypoesthesia at the knee and absent popliteal, dorsalis pedis and posterior tibial arterial pulsations. A clinical diagnosis of right lower limb gangrene secondary to vascular injury from parenteral pentazocine abuse was made. She had computed tomography (CT) angiogram of the right lower limb which showed complete cut-off of blood flow at the CFA. Her clotting profile was within normal range. She had crystalloids, blood transfusion, broad-spectrum antibiotics, analgesics and enoxaparin. Psychiatrist reviewed and prescribed Tegretol, zopiclone and other therapies. She had a provisional right above-knee amputation and thrombectomy of the PTFE graft (and the femoral artery) in conjunction with the vascular surgeon. She was given routine post-operative medications including DVT prophylaxis. However, the stump became gangrenous due to recurrent thrombosis of the graft and total blockade of blood flow to the stump. She eventually had right hip disarticulation which was complicated by surgical site infection and wound dehiscence at the region of the pre-operative infected inguinal wound. Wound microscopy and culture yielded Klebsiella spp., Pseudomonas aeruginosa and Staphylococcus aureus. She had antibiotic therapy (amikacin and imipenem) based on the organisms' sensitivity. The resultant defect from the dehisced wound was dressed with honey and chitosan 'KITO-KIT' dressing agent. The wound granulated and contracted well [Figure 2]. 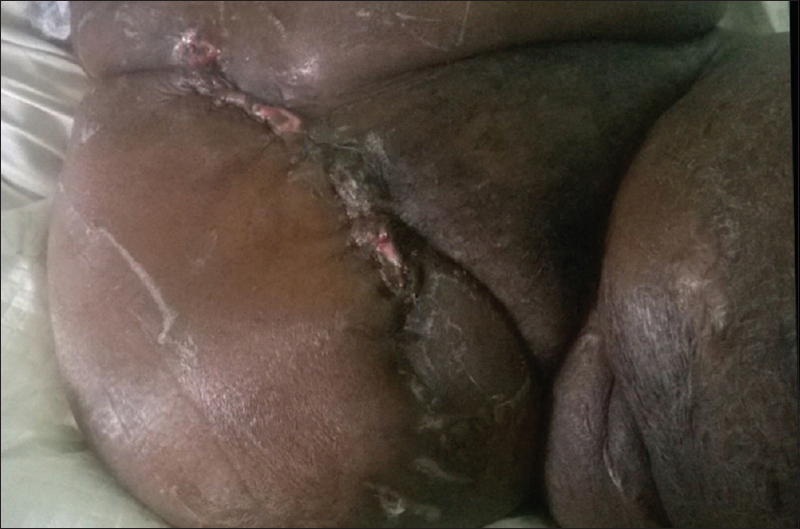 She had secondary wound closure about a month following hip disarticulation [Figure 3]. After 2 months on admission, she was discharged to a rehabilitation centre for rehabilitation and referred to the prosthetic unit for fashioning of prosthesis. She currently ambulates with bilateral axillary crutches, and she is regular with her follow-up clinic visits. There are reports in the literature on substances abuse such as buprenorphine, pethidine, morphine, pentazocine, cocaine and cannabis with varying cutaneous and vascular manifestations.,, In this index case, substances abused were injection pentazocine, tobacco and cannabis. Unstable marital relationship and single parenting were the pre-disposing risk factors to her depressive disorder and consequent drug abuse. In recent times, pentazocine injection has become rampant in all cadres of health institutions in Nigeria for the treatment of post-operative and/or post-traumatic pain. It can also be used as a premedicant for induction of anaesthesia, for conscious sedation in fracture manipulation and relief of severe pain in chronic conditions. Morphine and pethidine are sparingly prescribed by orthopaedic surgeons in most centres due to the inherent high risk of addiction and abuse. Hence, injection pentazocine is the preferred choice of all the opioids prescribed by most healthcare practitioners in our country and its combination with diazepam is one of the cocktails frequently used for fracture manipulation and minor surgical procedures. Pentazocine is a potent narcotic analgesic with both an agonist and antagonist action at opioid receptors. The lactate form of the drug is used for parenteral and rectal administration while hydrochloride form exists in the tablets. As an agonist, pentazocine provides analgesia by interaction of the drug on OP2 (κ) receptors, which then interrupts pain pathways in the spinal cord. Other agonistic effects are sedation and respiratory depression. As a weak antagonist on OP3 (μ) opioid receptors, high doses of the drug produce nalorphine-like dysphoric and psychotomimetic effects. Vascular complications from abuse of injection pentazocine in developing countries are scarcely reported in the literature. These complications include pseudoaneurysm formation, DVT, arteriovenous fistula, infected thrombi, arterial embolisation, infective endocarditis and gangrene. The exact pathogenesis of vascular complications of pentazocine abuse is unknown. However, the histologic evidence of end-arteritis and vascular thrombosis have been associated with parenteral pentazocine abuse., Padilla et al. reported DVT as a rare vascular complication of parenteral pentazocine abuse. It is pertinent to note that our patient also had a previous history of DVT of the same lower limb a year before presentation and was managed with enoxaparin. Patients who present with vascular complications following IV drug abuse frequently have viral infections as reported in Behera et al. study. This was in contrary to the findings in our patient, who was non-reactive to human immunodeficiency virus and hepatitis B and C viruses. This was probably because she did not engage in needle sharing with another IV drug abuser. Infected pseudoaneurysm is a common vascular complication in intravascular drug addicts., The groin region is also the most common site of arterial pseudoaneurysm because femoral vessel is frequently used to gain access by chronic drug abusers, and this was the scenario found in our patient. Extravasation of blood and contamination of the subsequent hematoma cause breakdown and rupture of the vessel wall leading to formation of an infected pseudoaneurysm, which is usually associated with a risk of catastrophic bleeding, limb amputation and mortality. Saini et al. reported 16.6% incidence of IV pentazocine abusers amongst 72 patients with infected pseudoaneurysms. Twenty-four patients (33.3%) in their study presented with life-threatening haemorrhage following a ruptured pseudoaneurysm. The life-threatening haemorrhage in our patient could have been from a ruptured infected pseudoaneurysm of the femoral artery. Yegane et al. in a study on surgical approach to vascular complications in IV drug abusers categorised patients with pseudoaneurysm into either unstable with active bleeding or stable patients with any other symptoms to determine the algorithm of treatment. Bleeding from ruptured pseudoaneurysm can be controlled by direct compression and resuscitation; urgent exploration, excision and local debridement of the necrotic tissue and simple ligation of the vessel with or without early revascularisation as a salvage procedure., Saini et al. and Arora et al. favoured simple ligation and excision of the involved vessel with delayed revascularisation when required. They argued that early reconstruction is not recommended since most of the pseudoaneurysms are usually infected at the time of presentation. The infection may contribute to graft failure and consequent gangrene of the limb. The proponent of early revascularisation at the time of resection of infected pseudoaneurysm argued that the procedure offers a better prospect for limb salvage. Reddy et al. also believed that the best time for reconstruction in those with lesion around CFA bifurcation is during the first operation rather than 12–24 h later when wound and vessel inflammatory reactions are peaking or when ischemic changes may be irreversible. The decision to re-vascularise should be based on clinical symptomatology and presence or absence of post-ligation Doppler signal. The absence of a pedal pulsation following a ligated vessel warrants an immediate or early revascularisation. However, patients whose pedal pulses are still present after ligation of the femoral vessel intraoperatively should not have revascularisation but should be followed up clinically and with duplex ultrasonography for features of severe vascular insufficiency such as disabling claudication and gangrene. Our patient had early revascularisation surgery following an absent post-ligation pedal pulsation on intraoperative continuous Doppler scanning of the lower limb. This limb salvage procedure in our case was complicated by surgical site infection, graft thrombosis and gangrene of the lower limb. Once a patient presents with gangrene of the limb, the treatment focuses on life-saving procedures: sepsis prevention, amputation surgery and rehabilitation. Agaja reported a case of forearm and hand gangrene following IV pentazocine abuse in a male nursing staff who was injecting the veins of his wrist and hand to relieve painful haemorrhoids. He subsequently had an amputation surgery. The major reason for failure of the salvage procedure in our patient was graft and femoral vessel thrombus occlusion. If the graft was infected, this could have incited inflammatory cascade with resultant vascular thrombosis, but there was no bacterial growth from the thrombus extracted during thrombectomy. The explanation for graft thrombosis could be from insufficient heparinisation after surgery, inherent risk of thrombus formation as evidenced by the previous history of DVT in our patient, positive family history of peripheral vascular disease and an unknown pre-existing arterial disease that might have predisposed her to developing graft thrombosis. Furthermore, a direct toxic effect of recreational drugs on blood vessels can produce chemical endarteritis resulting in endothelial damage, platelet activation and localised thrombosis. A Doppler ultrasonography or a spiral helical CT angiogram will objectively help in determining the level of amputation. Our patient did a CT angiogram which revealed complete cut-off of blood flow from the CFA downwards. She subsequently had an above-knee amputation; hoping perfusion will be restored after a thrombectomy (of the graft and superficial femoral artery) was carried out by the vascular surgeon. Despite adequate hydration, heparinisation, antibiotics and limb elevation postoperatively, the attempt to re-perfuse the above-knee stump failed. Possible explanations were recurrence of thrombosis from the inherent risks earlier mentioned, occult tissue death due to prolonged ischemic time (due to late presentation to our facility), anaemia, stump infection and endarteritis resulting from multiple substance abuse including tobacco and cannabis. The stump became gangrenous, and the patient underwent hip disarticulation as the last resort. Although the patient should have had a hip disarticulation from the outset based on the CT angiogram findings, she was only convinced when stump gangrene developed. Surgical site infection of the disarticulated hip stump likely resulted from a background pre-operative infected groin wound and tissue hypoxia from reduced perfusion. The wound cultured multiple microorganisms including P. aeruginosa, the bacteria usually seen amongst IV drug abusers. This is also a common complication seen in patients with infected pseudoaneurysm. Mullan et al. reported a case of CFA necrosis due to intra-arterial heroin injection. 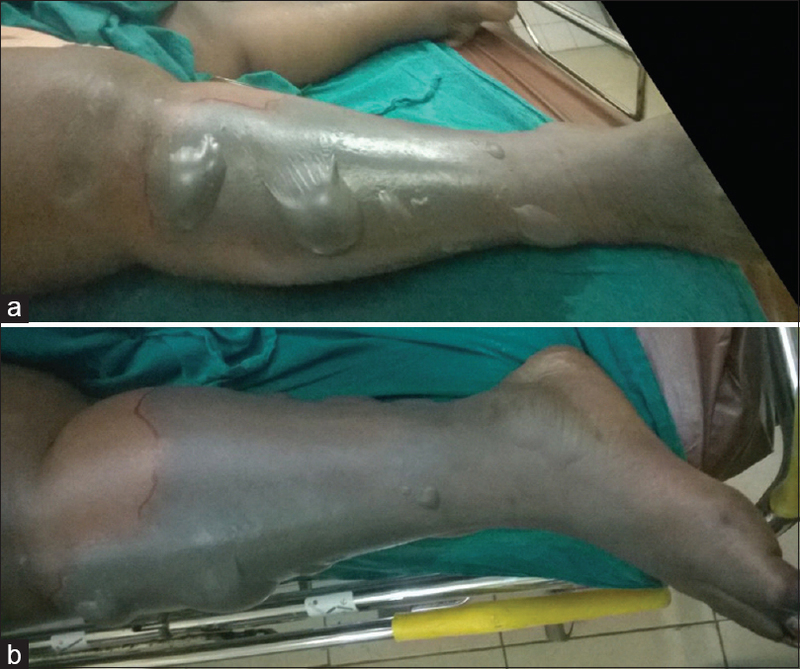 Their patient presented with life-threatening haemorrhage that necessitated emergent ligation of the bleeding vessel and early revascularisation surgery with autologous vein graft taken from deep femoral vein of the same limb. This surgery was complicated by torrential haemorrhage, and their patient had a second surgery where rectus femoris flap was raised to cover the vascular graft. Reperfusion was restored, and the limb survived despite a graft failure noted in their patient. Hip disarticulation amongst IV drug abuser is an uncommon phenomenon. Rajeswari et al. reported a case of hip disarticulation in a postnatal IV methadone and heroin abuser. The indication for amputation surgery in their patient was necrotising fasciitis of the lower limb. This amputation surgery has added to the list of psychosocial problems that led to the substance abuse in the first instance. Physical and psychological rehabilitation will be a lifelong process in our patient. Pentazocine abuse is on the increasing trend in our environment. Patients who have a history of substance abuse are more likely to abuse other agents such as pentazocine. We suggest that awareness should be created amongst healthcare practitioner concerning the addictive tendency of pentazocine and the need to regulate its prescription. The management of ruptured infected pseudoaneurysm should be geared towards life-saving and limb-saving procedures. Widespread education of the populace concerning the morbidity and mortality associated with pentazocine abuse cannot be overemphasised. Coughlin PA, Mavor AI. Arterial consequences of recreational drug use. Eur J Vasc Endovasc Surg 2006;32:389-96. Reddy DJ. Treatment of drug-related infected false aneurysm of the femoral artery – Is routine revascularization justified? J Vasc Surg 1988;8:344-5. Padilla RS, Becker LE, Hoffman H, Long G. Cutaneous and venous complications of pentazocine abuse. Arch Dermatol 1979;115:975-7. Sarraf S, Singh S, Pandey SS. Cutaneous complications of parenteral pentazocine abuse. Indian J Dermatol Venereol Leprol 1996;62:191-2. Behera A, Menakuru SR, Jindal R. Vascular complications of drug abuse: An Indian experience. ANZ J Surg 2003;73:1004-7. Hederson K. Pentazocine. Update Anaesth 2008;24:8-12. Available from: http://www.worldanaesthesia.org. [Last accessed on 2018 May 15]. Iheanacho OE, Ezenwenyi IP, Enosolease ME. Pentazocine abuse in sickle cell disease patients seen at a tertiary hospital in Nigeria: A chronic menace. Int J Trop Dis Health 2015;9:1-8. Olatunji PO, Makanjuola AB. Pentazocine abuse in sickle cell anemia patients: A report of two case vignettes. Afr J Drug Alcohol Stud 2009;8:59-64. Palestine RF, Millns JL, Spigel GT, Schroeter AL. Skin manifestations of pentazocine abuse. J Am Acad Dermatol.1980;2:47-55. Saini NS, Luther A, Mahajan A, Joseph A. Infected pseudoaneurysms in intravenous drug abusers: Ligation or reconstruction? Int J Appl Basic Med Res 2014;4:S23-6. Yegane RA, Salehi NA, Ghaseminegad A, Bahrami F, Bashashati M, Ahmadi M, et al. Surgical approach to vascular complications of intravenous drug abuse. Eur J Vasc Endovasc Surg 2006;32:397-401. Arora S, Weber MA, Fox CJ, Neville R, Lidor A, Sidawy AN, et al. Common femoral artery ligation and local debridement: A safe treatment for infected femoral artery pseudoaneurysms. J Vasc Surg 2001;33:990-3. Patel KR, Semel L, Clauss RH. Routine revascularization with resection of infection femoral pseudoaneurysms from substance abuse. J Vasc Surg 1988;8:321-8. Reddy DJ, Smith RF, Elliott JP Jr., Haddad GK, Wanek EA. Infected femoral artery false aneurysms in drug addicts: Evolution of selective vascular reconstruction. J Vasc Surg 1986;3:718-24. Agaja SB. Complication of intravenous drug abuse of pentazocine causing deformity, extensive ulceration and gangrene of the left forearm and the hand – A case report. World J Med Sci 2006;1:155-7. Mullan MJ, Magowan H, Weir CD. Femoral artery necrosis due to parenteral intravascular drug misuse: A case report and literature review. Ulster Med J 2008;77:203-4. Rajeswari J, Smith NA, Glass K, Howarth F. Necrotizing fasciitis: A case of hip disarticulation in a postnatal intravenous drug abuser. Obstet Med 2009;2:40-1.